This handmade Pink, Aqua and Salmon Girl Dog and Cat Collar is perfect for the Spring and Summer Season. The floral collar can be purchased in either a buckled or martingale style. A matching leash and metal buckle upgrade are available option selections when ordering. 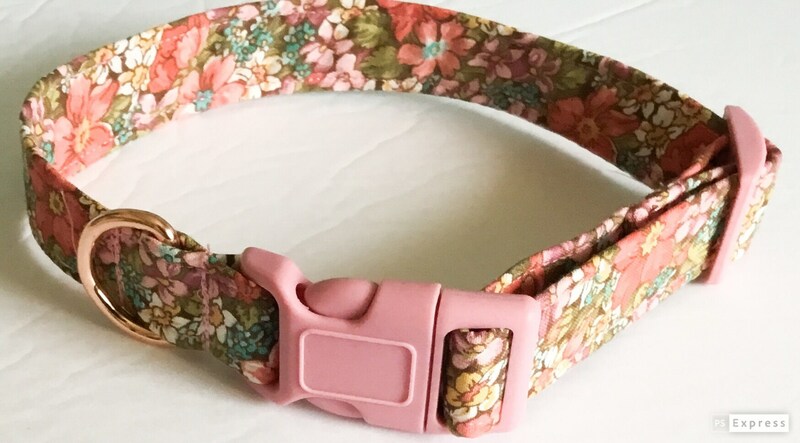 All buckled collars are made in sizes including XXS, XS, S, M, L, XL with option width sizes of 3/8 inches for toy dogs or cats ( Cats receive collar breakaway hardware unless otherwise requested), 5/8 inches, 3/4 inches, 1 inch and 1.5 inches. Martingale collars are made in sizes of S, M, L, and XL with width band sizes including 5/8 inches, 3/4 inches, and 1 inch.